I have been wanting a decorative ladder for so long, I couldn’t help making one. 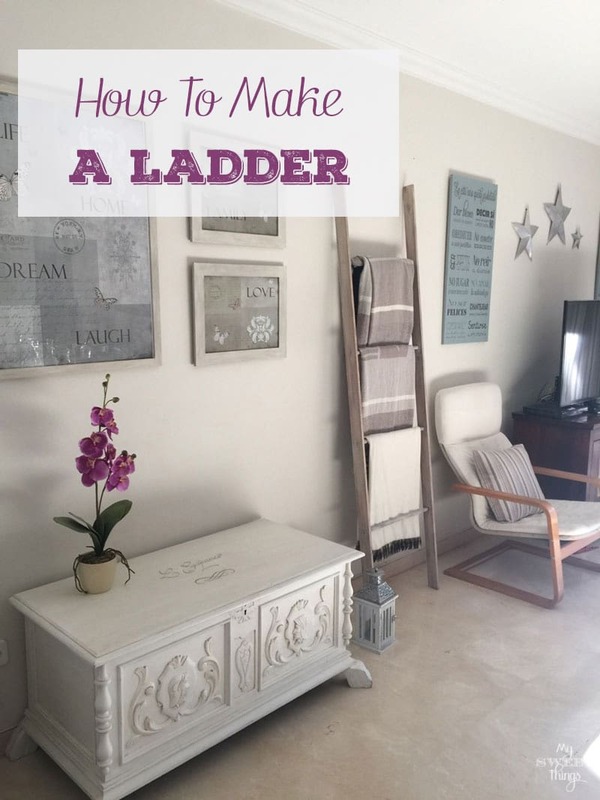 I saw ladders everywhere, on blogs, Pinterest, shops… everywhere! If you like something, then it seems you attract it… or maybe it is because you are more aware and then you can see it. It is the same as when you are pregnant, you see bellies all around! Well, the thing is that I wanted a ladder, yes or yes, but I was not willing to spend the amount of money shops were asking for one. Then, what can a DIY girl do? Make one! 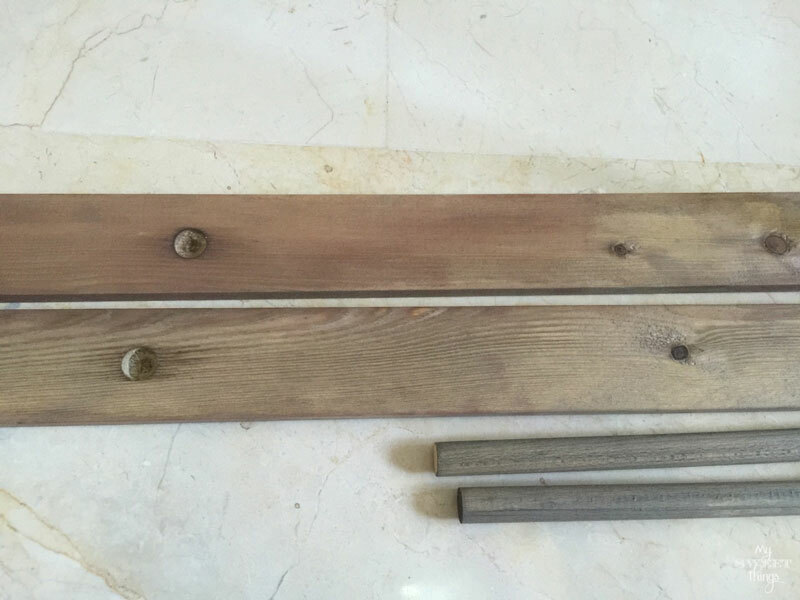 So one day I woke up and headed to the shop and bought two wood strips and a wooden dowel. 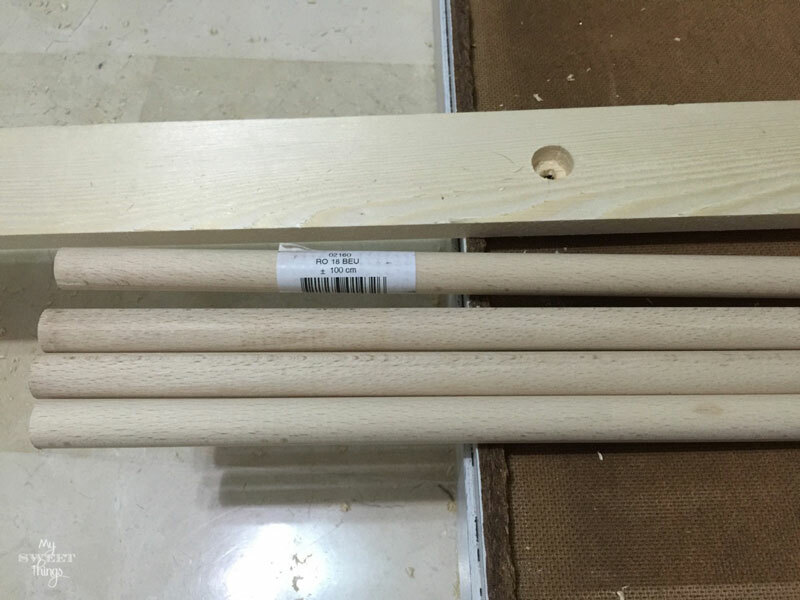 As soon as I reached home, I made some measurements and cut the dowel into four pieces, and I also made four holes on the wood strips. 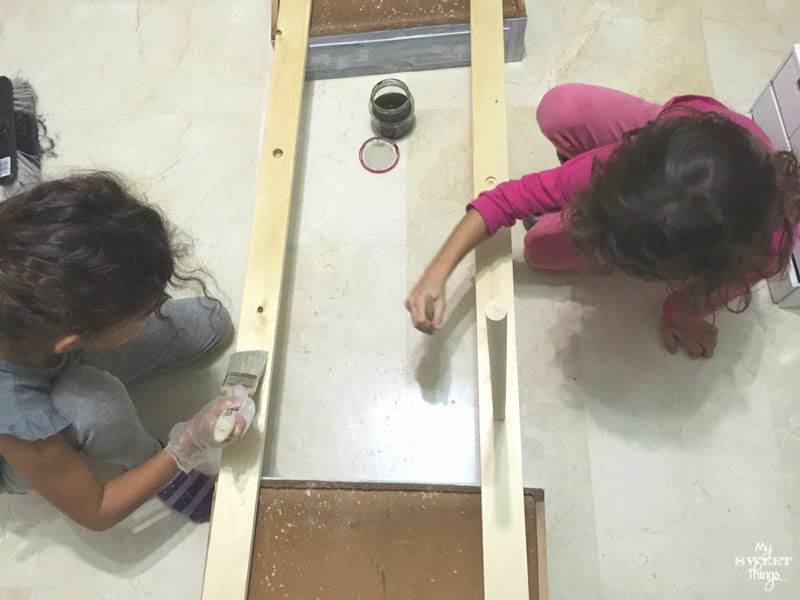 The girls happily helped me to sand the wood. Then it was time to dye them with the “Miracle Liquid” as I call it, all sides and the dowels too. 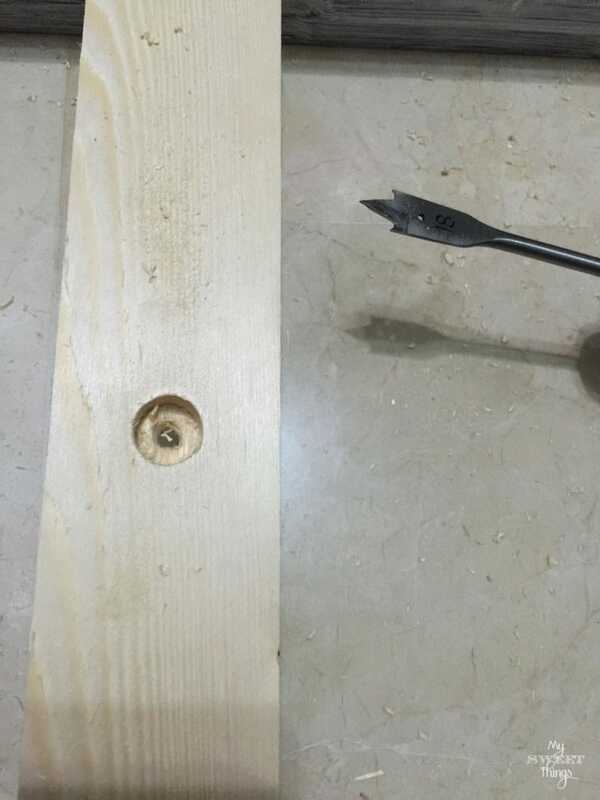 I didn’t want to see the holes at the sides of the ladder, and I decided to use some sawdust mixed with glue to cover them. Look at that color!! Love it, but I wanted a weathered look for it. Nothing difficult, you can check the how to. Much better for my taste. Once all the wood was weathered, I glued all together and it was done! Time to place the throw aways and relax with a cup of tea. But I had to keep an eye on it because the girls asked me if they could climb… no, pretty girls, not for climbing, just for displaying and styling. But we can make a pompom garland and place it on the top if you like. Then they were happy. I like so much the color it has. I hope you like the ladder too! 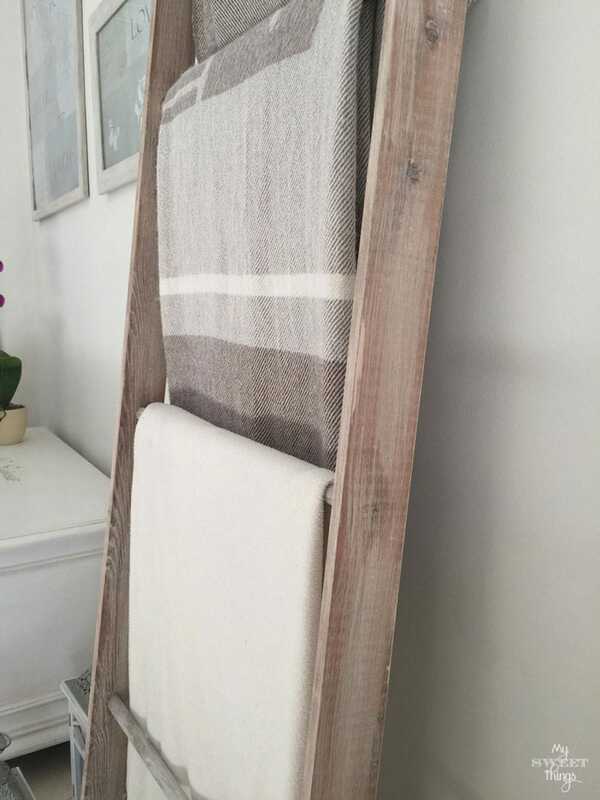 This entry was posted in DIY and tagged Decor, DIY, Furniture, home decor, Ladder, wood. You GO!! You have become a regular carpenter! This is absolutely great. You see something and you go out and just make it yourself. I love the color that you have dyed it. And you have the best little helpers in the world! 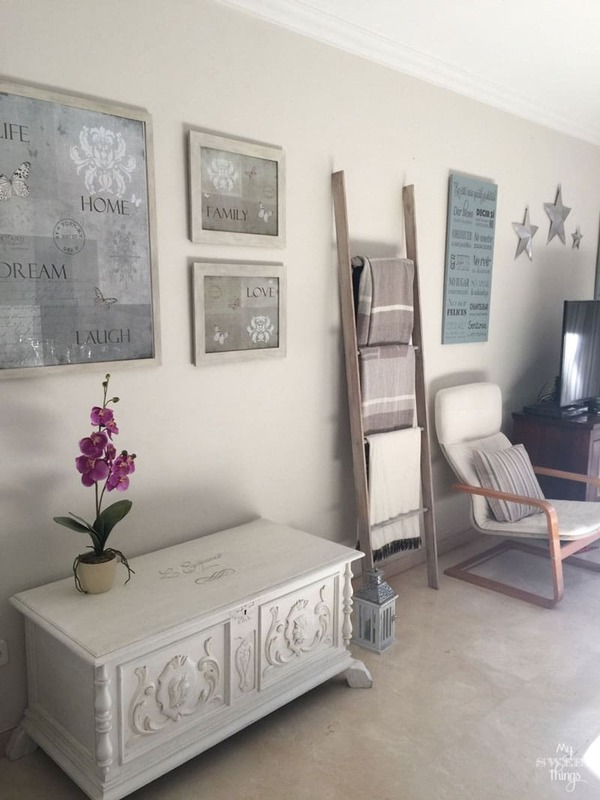 It is also a stunning statement piece in your room. Thank you, Mary! By the time my husband comes back home he won’t recognize it lol. But do you know what? I wanted it to be in a specific place and once it was done it didn’t fit as good as I had imagined, so I sold it. That place is now for the wine rack, my new love. My helpers are the best helpers I could ask for, love them so much. Pili, great job on your blanket ladder!! It looks wonderful with your throws on it!! That’s funny that your kids wanted to climb it, mine would have been the same way. 🙂 This looks fantastic!! I think all kids would ask to climb it, if I were a kid I would love to! Thank you so much for the compliments, Keri!! I love your decorative ladder Pili! 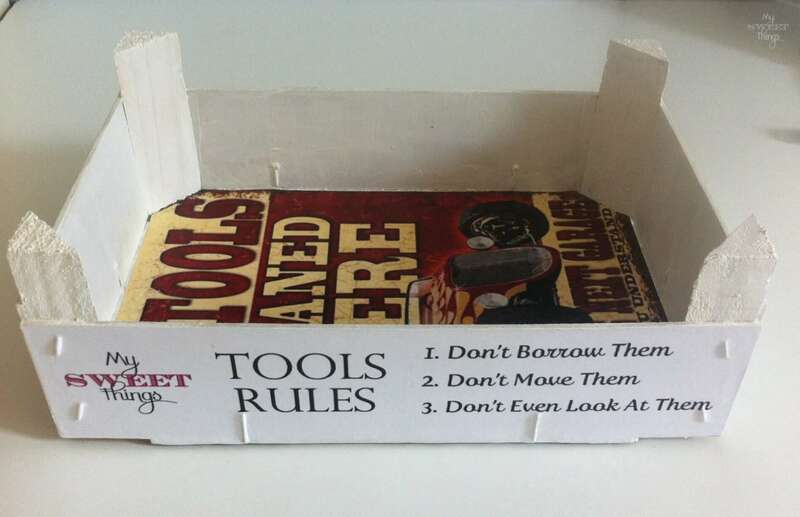 The sawdust and glue idea is genius, not to mention frugal. It didn’t know the stain was called miracle liquid (pinned it). Beautiful job! Many thanks, Heather! The tip with the sawdust and glue is great when you plan to dye the wood, as you get the same color everywhere. I don’t think the stain is called that way, it’s just the name I gave it because it is miraculous! I know, I am hooked now!! Not as difficult as I thought! 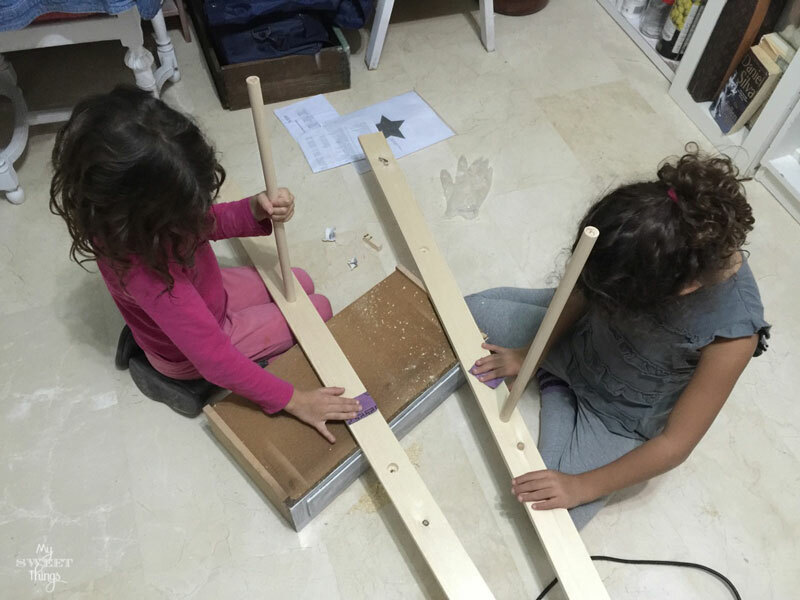 The girls love to be involved in my projects, and I am glad they like it. This is great – I’d love it if you shared it the brand new – DIY blog party! Thank you so much, Helen!! Shared and thanks for the invite! This is lovely! I made one similar last year out of bigger boards and its just too bulky. This is perfect! I really like the color! Great job! Hi, Malissa!! I don’t have too much room in the apartment, so it had to be quite tiny. Many thanks for your comment!! I love it! 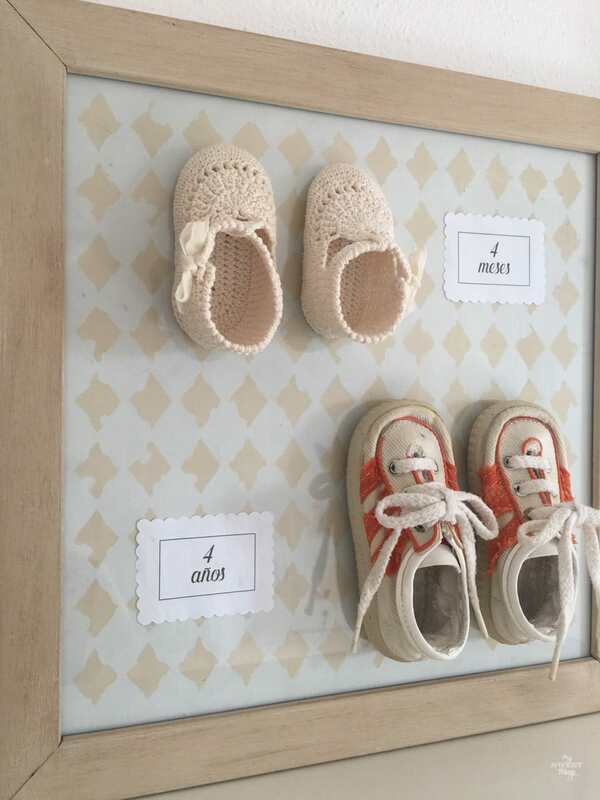 What a great idea to make your own and customized it to just the right size. Thanks for sharing your tutorial with us at Talk of the Town. Pinning. You are very welcome, Betsy. 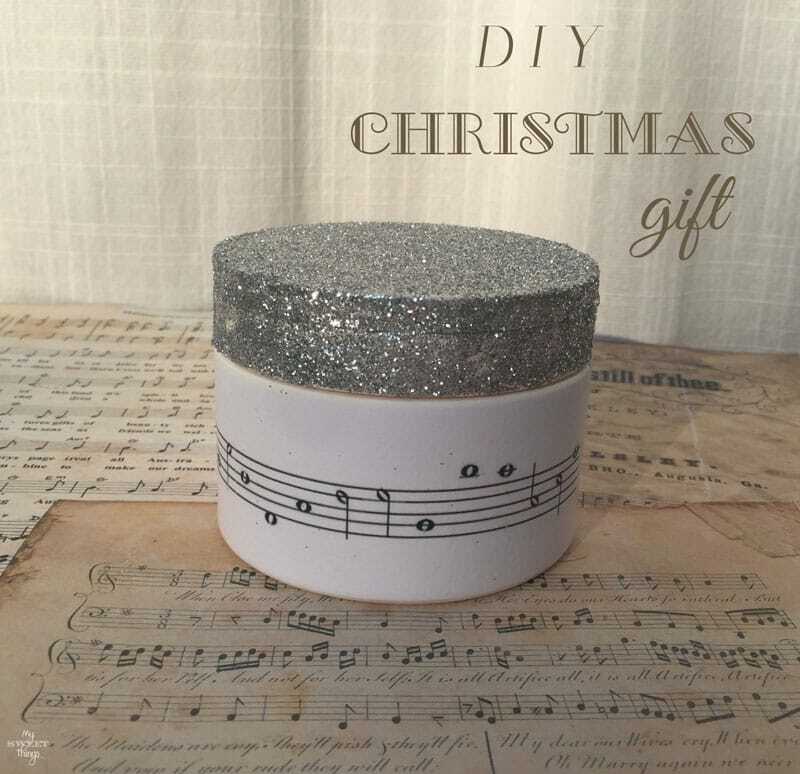 I hope someone can follow the tutorial hand make something they like for their own home. I love it! 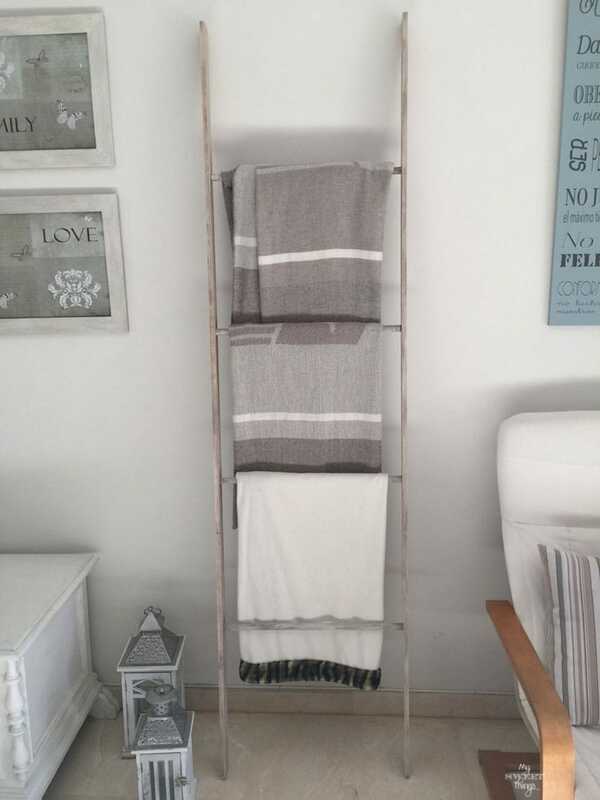 I’ve just redone my bathroom (and given it a kind of workshop meets municipal baths kind of look) and I keep saying that what it really needs is a ladder to hang the towels on but like you, I don’t really want to pay the prices the shops want for them so maybe I should give making one a go myself! Thanks for the inspiration. Hi, Sarah! 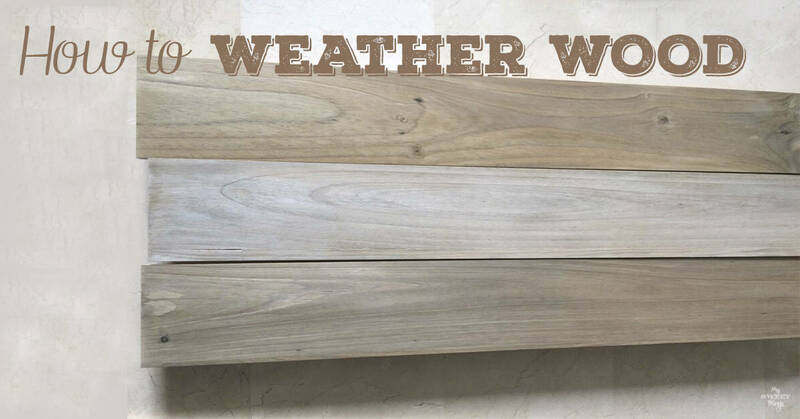 As you can see from the post, it is not difficult at all to make one, and I am sure using real old wood it would look great in your bathroom! Your ladder turned out awesome! I had been drooling over all those old ladders repurposed on Pinterest and all over for months before I had the chance to do the same with one of my Grandpa’s old ladders. I use it for throws and high heals up in our master closet! Isn’t it amazing how useful they are? Tarahlynn, that’s wonderful! It must be great to be able to use it not only to display or keep throws, but that you can also climb on it to reach higher things. 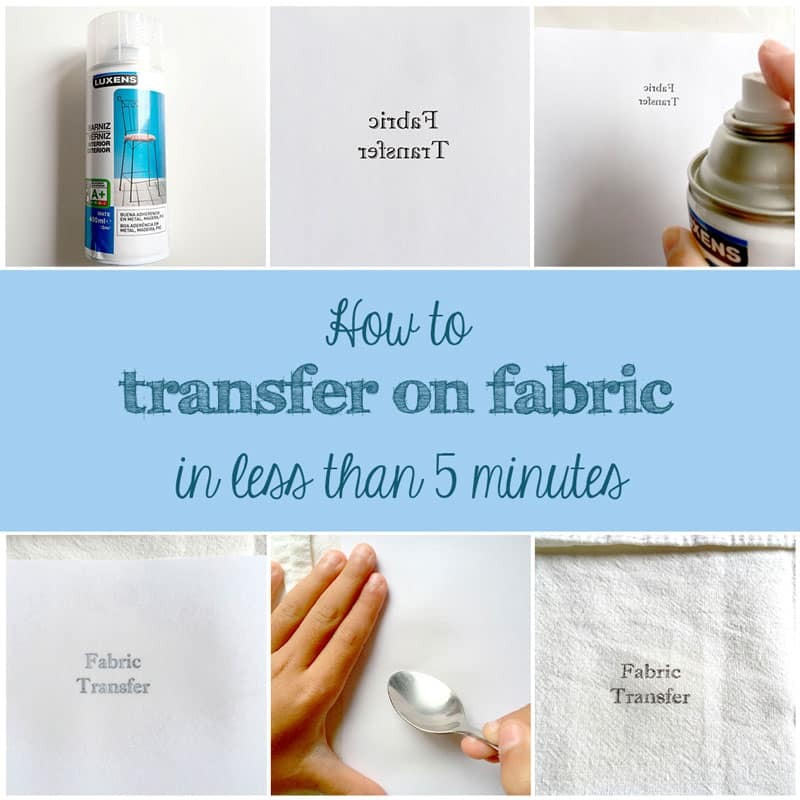 Really useful! I love this. Can’t wait to make one. I’ve worried about my kids climbing on it also. Very cute! Haha, it was my concern too but they understood it was only to keep the throws so they left the ladder in peace. Your ladder looks awesome. I could see it being used as a towel rail too. So many uses. It looks lovely and so much nicer than a bought one. 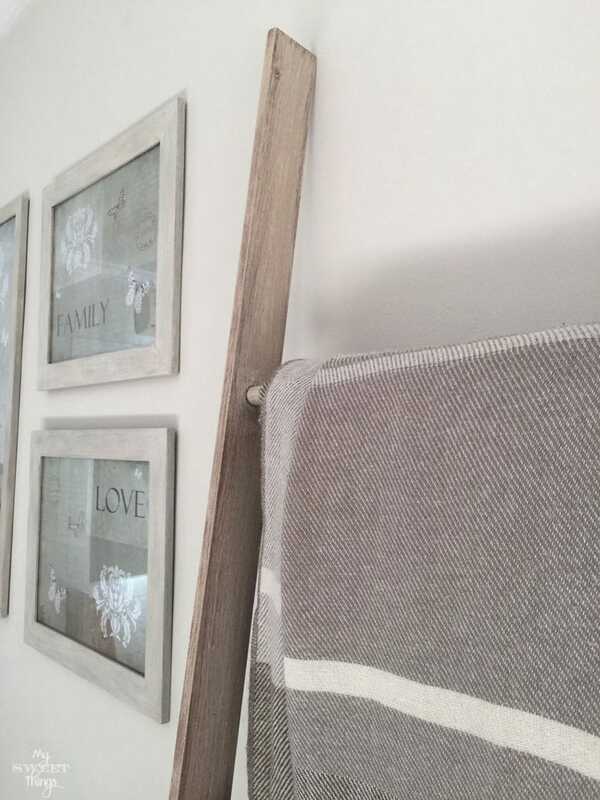 Yes, it would work great as towel rail too, but my bathroom is tiny so in my case is not an option… at least in this house, who knows! 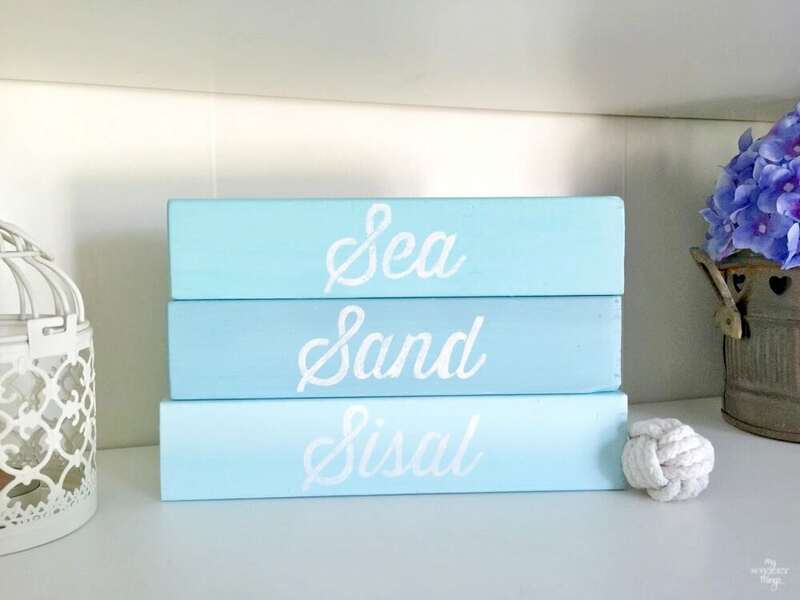 What a great project to add decoration to your home. Thanks for sharing it with us at the Over the Moon Link Party. Thank you so much for visiting, Sandy!! Have a wonderful week! 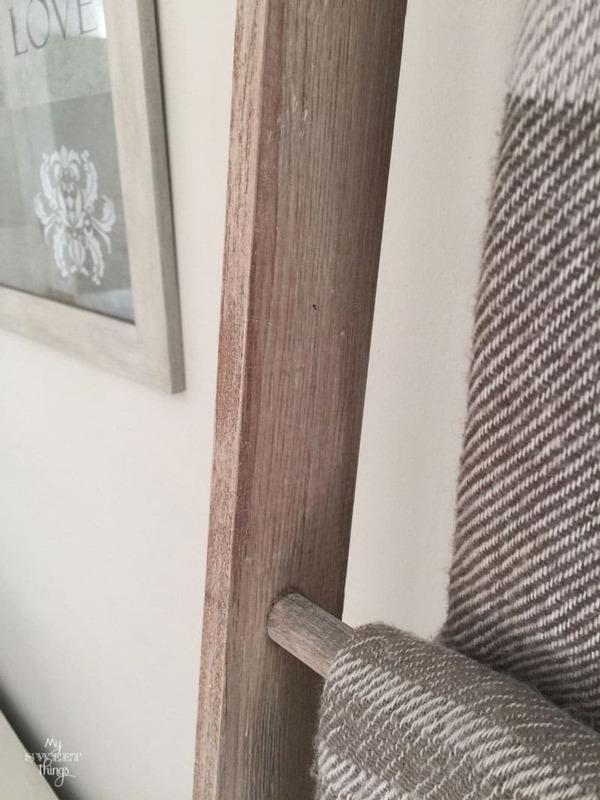 Hi Pili, I’d never heard of a decorative ladder before now, but how useful for holding throws or something similar on. Love the fact your girls help you out too. Yes, Debbie, it is really useful because it takes no space in the room. We had previously a wicker basket which the girls took for their toys. They really like to help me, and I am happy they do. Love that you made your own ladder Pili. It turned out so amazing, and the weathered look is fabulous. Thanks so much for sharing this at Vintage Charm. Many thanks for your comments, Tuula. Hope you have a wonderful week ahead! Wow! How creative to make your own ladder. I love the weathered look of the wood. I love how beautifully it fits the decor of your room. Thanks for sharing at Your Inspired Design Link Party. so nice to have you. Hi, Carol!! Thank you so much for your kind words and visiting, I love to join your party every week! That’s great Michelle!! It will save you some money for sure! Haha, my head aches when it’s been about 3 days without doing anything! See you at the party, Mimi! Wow, leave it up to you to figure out how to do something even better and cheaper then the original! It looks really great in that area of your home. 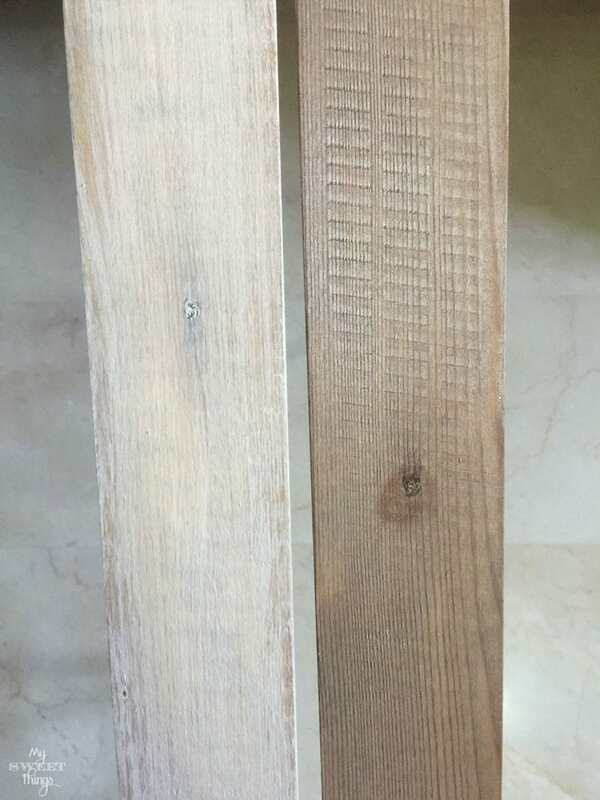 I love the color and the whitewash over the stain, the wood grain really shows through. You amaze me.